However, the majority of scallops are free-living and can swim with brief bursts of speed to escape predators (mostly starfish) by rapidly opening and closing their valves. Indeed, everything about their characteristic shell shape – its symmetry, narrowness, smooth and/ or grooved surface, small flexible hinge, powerful adductor muscle, and continuous and uniformly curved edge ��� facilitates such activity. They often do this in spurts of several seconds before closing the shell entirely and sinking back to the bottom of their environment. Scallops are able to move through the water column either forward/ ventrally (termed swimming) by sucking water in through the space between their valves, an area called the gape, and ejecting it through small holes near the hinge line called exhalant apertures, or backward/ dorsally (termed jumping) by ejecting the water out the same way it came in (i.e., ventrally). 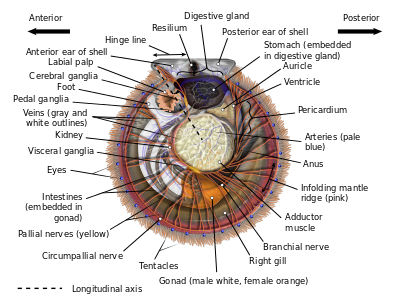 A jumping scallop usually lands on the sea floor between each contraction of its valves, whereas a swimming scallop stays in the water column for most or all of its contractions and travels a much greater distance (though seldom at a height of more than 1 m off the sea bed and seldom for a distance of greater than 5 m). Both jumping and swimming movements are very energy-intensive, and most scallops cannot perform more than four or five in a row before becoming completely exhausted and requiring several hours of rest. 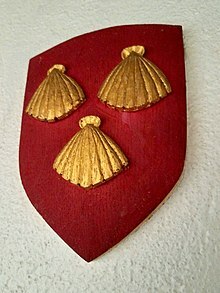 Should a swimming scallop land on its left side, it is capable of flipping itself over to its right side via a similar shell-clapping movement called the righting reflex. 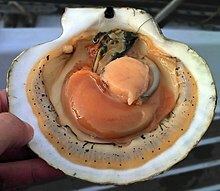 So-called singing scallops are rumored to make an audible, soft popping sound as they flap their shells underwater (though whether or not this happens is open to some debate). Other scallops can extend their foot from between their valves, and by contracting the muscles in their foot, they can burrow into sand.